The Bedminster AnyWare Center provides great access to the international finance, business and cultural hub of New York City. 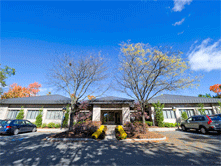 It's located just 30 minutes from Newark International Airport and is also close to the commuter town of Bridgewater. Learning Tree's AnyWare Centers provide a distraction-free learning environment, dual screen computers and high-speed internet. From Newark Airport: Take I-78 West to I-287 North, follow below directions. Take jug handle to 202/206 South. At 3rd light, make left onto Washington Valley Rd. Go 1/3 mile and make right at the Verizon Wireless sign. We are the one story building in front of Verizon Wireless. Take Route 202-206 South, Pass Route 287, pass 'The Hills' shopping plaza on your left. At next light, make left onto Washington Valley Rd. Go 1/3 mile and make a right turn at the Verizon sign.